BLOG - For many years the museum’s aula, built in 1953 after a design by Henry van de Velde, was a forgotten place. But as of February this year, the space has been reinvigorated. The aula was not part of the museum of Helene Kröller-Müller, but it was originally on her wish list as a space for cultural activities. For her, a museum was not only a place to hang paintings, but also for education, even though that concept had a different meaning in her time than it does today. Thus, she envisaged not school classes, but the spiritual enrichment of the interested citizen. In her words: ‘We also wanted to give the Van de Velde building not only the function of a museum for paintings, but, once it was completed, by seeking contact with the public in all kinds of ways, we wanted to attempt to elevate it and have it become a centre of spiritual life in the field of visual art. We hoped that in this museum people would orient themselves towards the American example, where regular guided tours take place, courses and lectures are held and questions that arise in the field of art are elucidated by experts’. But in the building that opened as the Rijksmuseum Kröller-Müller on 13 July 1938, there was no room for this ideal. The limited means available for the construction of the museum resulted in a much smaller building than Helene initially had in mind, and her paintings were given priority in that building. 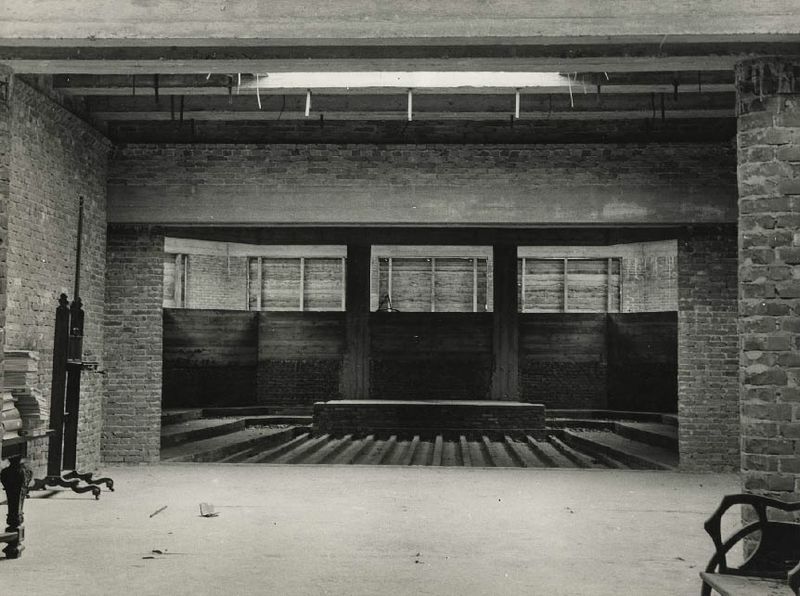 It was only after her death that Henry van de Velde made the design for the aula, which was realized in 1953. Lectures, film screenings and music and theatre performances were held there. In the 1970s, as part of the new building by Wim Quist, a new, much larger auditorium was built. With this, the ‘old’ aula lost its original function and the interior with curtains and benches also disappeared. Although the space was still used for various purposes, it changed from a beating heart to a bare and cold backroom. In 2015, a plan was drawn up to give the aula its old sparkle back and make it suitable again for small meetings and receptions for associates. For this, the space first had to be adapted to the current requirements in terms of heating and acoustics. 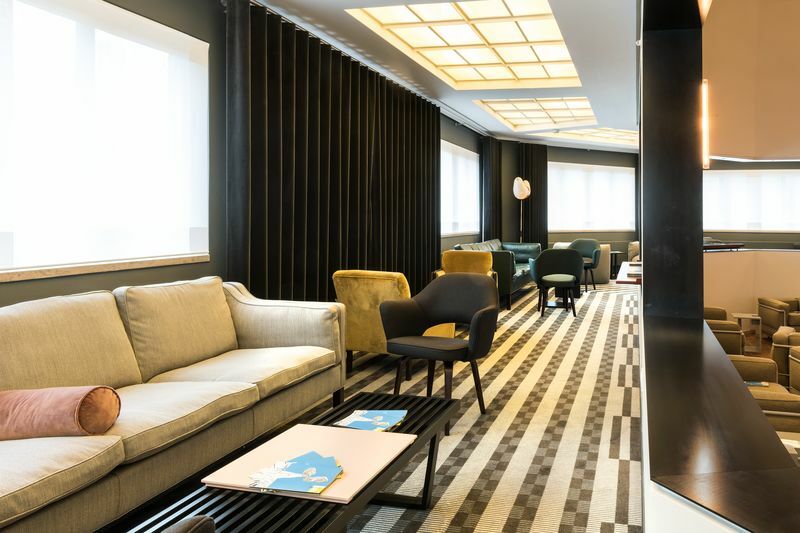 Evelyne Merkx (Architects – Interior Architects Studio Merk X) designed a new interior with salon-like seating, curtains, carpeting and lighting. Part of the furnishing consists of recycled ‘classics’ by designers such as Le Corbusier, Charlotte Perriand, Arne Jacobsen, Børge Mogensen and Eero Saarinen. The furniture was lovingly restored by Morentz in Waalwijk. 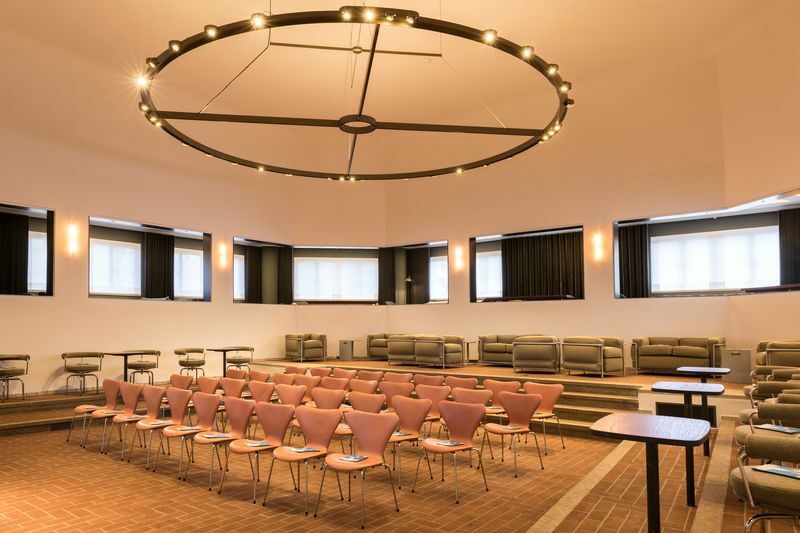 Thanks to this interior design, the aula has regained its allure and a warm and atmospheric space has been created for receptions, dinners, and naturally also for ‘courses and lectures’. Helene would have been pleased with it.